For the purposes of our thinking we will use “digital” an umbrella term to describe the set of challenges, opportunities and issues that arise from a combination of information and telecommunications technologies. Why digital? For one, “technology” is too broad a term. At HKS — and I suspect schools of policy and government in general — technology refers to not only information technology but all technologies and what I think many in the public would think of as areas of science like nuclear energy, biotech and climate change. This is clearly outside the purview of digital (and/or what I’m personally focused on). Words matter. If you run around using technology synonymously with information technology, some very smart and generally supportive people doing important and good work will rightfully be offended. Let’s not fight academic battles with allies — we have more important ones to engage in (privacy, user centric approaches, security, surveillance, regulation, etc..). Here at Digital@HKS we are as much, if not more, interested in the social, economic and policy changes brought about by the way digital technologies expand or threaten how we can solve problems, relate to one another, and reimagine institutions and the world. Information technology risks focusing us on the technology. The intent of using “digital” (while admittedly imperfect) is to try to be broader, to allow us to acknowledge the foundational role information technology plays, but focus on how we as individuals and society think about digital, interact with, use and are shaped by it. This is the second in a series of pieces about how I’m wrestling with how to teach about digital technologies at policy schools. If you’re interested follow me here on eaves.ca. You can also read part one. This entry was posted in Uncategorized on June 14, 2017 by David Eaves. Digital technologies matter because our society, our economy, and our organizations have — for better and worse — become digitized. If policy makers and public servants can’t understand what this means, how it alters the production of public goods, or its impact on management, regulation, the economy, and policy, we are in trouble. The Indian government is tying biometrics of its 1.3 billion citizens to a (nominally voluntary) digital identification system that will be required to access key government services and bank accounts. What does this mean for privacy, security and how the state delivers services? In France and America, foreign actors hack into the main political parties’ email systems and leak contents in an effort to sway elections — or at least, to destroy the information sphere and make coherent public discourse impossible. Can democracies survive persistent digital disinformation campaigns? In America, the failure of the healthcare.gov launch almost cost a sitting president one of his signature policies. Do governments possess the capability to deliver digital services? Simple artificial intelligence systems could displace call centers, threatening to remove one of the lower rungs of the economic development ladder for some of the world’s poorest countries. Will digital technologies impede economic development for the world’s poor? In August 2011, Marc Andreessen — inventor of the first widely-adopted web browser and founder of Andreessen Horowitz — wrote a Wall Street Journal piece, “Software is Eating the World.” For many, the piece smelled of hubris, as markets (and the public) could still remember the dot.com bubble of a decade earlier. Andreessen’s assertion has proven prescient. Today, the five largest companies in the world (by market capitalization) are technology companies. And those that are not, like GE, are busy trying to redefine themselves as such. But this ascension of digital in the world of business is only a part of the story. Andreessen’s confidence rested in part on the observation that across the business and public sector — and even one’s personal space — there existed millions, if not billions, of processes which today are either analog, undocumented, or automated but unconnected to the internet. He saw billions of tasks and activities — from the mundane (renewing your parking permit) to the critical (detecting tax fraud) — that software can or could do. And as more systems, more “things” and more services digitize, the possibilities and challenges will grow exponentially. This is why software still has much “eating” to do. Andreessen’s piece has numerous implications. There are three I believe will matter above all others for schools of policy and government like the Harvard Kennedy School. The first involves a fairly straight forward implication of Andreessen’s analysis. An alternative reading of Andreessen’s op-ed title is “How digital is eating the physical.” It is the digital sphere — and the rules, norms and structures that come to define it—that will, in many cases, control the physical sphere. This is why digital’s impact on the economy, democracy, and society should not be underestimated. It is also why understanding, shaping and engaging in those rules, norms and structures is essential to a policy school. Those interested in the public sphere will need frameworks and tools to address questions of ethics in digital technologies, to say nothing of its impact on equity, the public good, safety, privacy and innumerable other issues. The second involves a renewal of institutions. Digital is transforming how we work and how institutions are structured and managed (imagine running a company in the present day without email — or for the hip among you, Slack). Government is no exception. What government can and should look like in a digital age is a real and pressing question. This is why digital transformation is such a buzz word. Organizations (governments, NGOs and companies) are all grappling with how to stay competitive or relevant, and it is forcing them to rethink how they are structured, how they process information and what skills their employees have. This is true in the private sector; again, GE serves as an example as it tries to shift from manufacturing to information services. The advantage of the private sector is that when organizations fail to make the transformation, they unwind, and their capital and assets are redeployed. The public sector has no such advantage. And you don’t want to live in a country where the government becomes obsolete or incapable. This makes digital transformation for schools of policy and government both urgent and critical. Which brings me to the third way digital matters to schools of policy and government. People often talk about how technology — our digital world — accelerates the pace of change for both good and ill. There is indeed much that is speeding up. I believe the core opportunity and requirement of the digital age will be to accelerate how organizations learn. Digital provides the infrastructure — systems to measure, collect and analyze data, more easily than ever before. The question is how public institutions will adapt to and responsibly use these capabilities. Can governments become learning organizations that move at the speed of digital? And I mean this not just in the provision of services but in the development of public policy, regulatory regimes and innumerable other areas? At its heart, digital is unleashing a cultural and organizational change challenge. One that pits planners (bureaucratic systems comfortable with detailed but rigid plans and policies laid out in advance) and learners (agile oriented systems that seek to enable governments to learn and adapt), sometimes in real time. Balancing the world views of learners and planners, while continuing to constrain both with a strong system of values and ethics essential for public institutions, is a central challenge. Digital matters in policy schools because unlike many of my technologist friends, I don’t think government is irrelevant. Nor do I believe it has permanently been left behind. Governments are slow moving, but immensely powerful beasts. They are also beasts that respond very aggressively to threats. I do not worry about governments failing to adapt to the digital age — they will eventually do that. I fear how governments will adapt. Will a world of agile, learning governments power democratic rights that enable us to create better societies? Or will they surveil us and eliminate dissent to create societies that serve their interest? That future is up for grabs. It is why digital matters to schools of policy and government. It is why it matters to me. It is why I’m here at the Kennedy School. This is the first in a series of pieces about how I’m wrestling with how to teach about digital technologies at policy schools. If you’re interested in part two, follow me here at eaves.ca or on the Digital@HKS blog on Medium. This entry was posted in Uncategorized on June 13, 2017 by David Eaves. 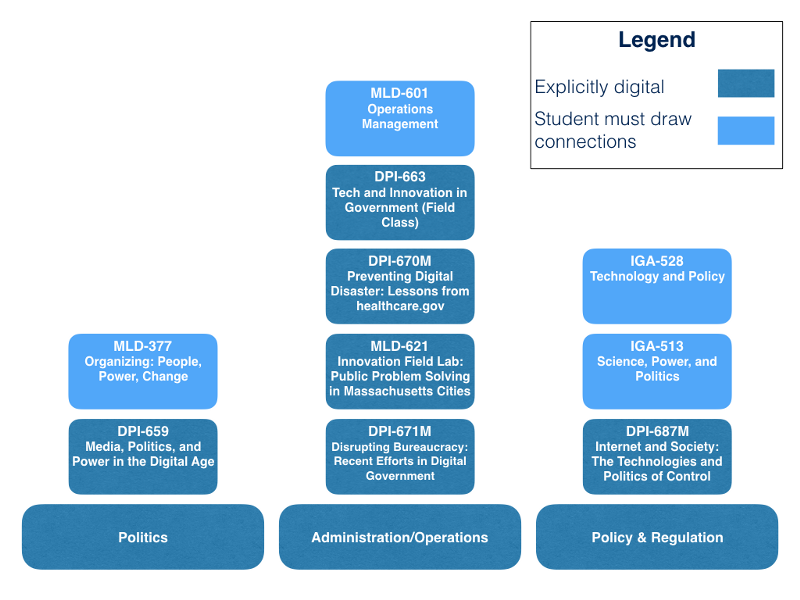 Since arriving as a Lecturer at the Kennedy School of Government at Harvard, I’ve been thinking a lot about how to integrate digital into the curriculum. I have a course on Digital Government and will be teaching modules next term on what we’ve learned from Digital Services (like USDS and GDS) as well as one dissecting why Healthcare.gov failed and what we learned. However, many students ask me what else they should be taking. And while I have broader thoughts on what policy schools and schools of government should be doing (more on that in another piece), carving out a digitally oriented curriculum based on assets the school already has is both a good exercise and can provide some instant advice to interested students. And the good news is, there more that touches digital at the Kennedy School than people realize — it just isn’t always framed that way. So, for students looking at this space there are two ways I would look for courses. The first is to identify courses that zero in on some areas of knowledge that are core to understanding digital. I’ve identified 5 that I think every school should focus on (and would love feedback on these): User Needs, Design Thinking, Data, Privacy and Security (and yes, privacy and security are separated for good reason!). I have more thoughts on why I’ve chosen these 5, but will save that for another piece so we can stay focused. Having a grounding in each of these topics is critical. They touch pretty much every other topic, concept and idea in the digital space. I cover each of these in my DPI-662 to provide students with such a grounding, but ideally there are (or should be) more courses that would allow students to delve even deeper into them. With that in mind, the chart below outlines some courses I know, or suspect, would accomplish this goal. 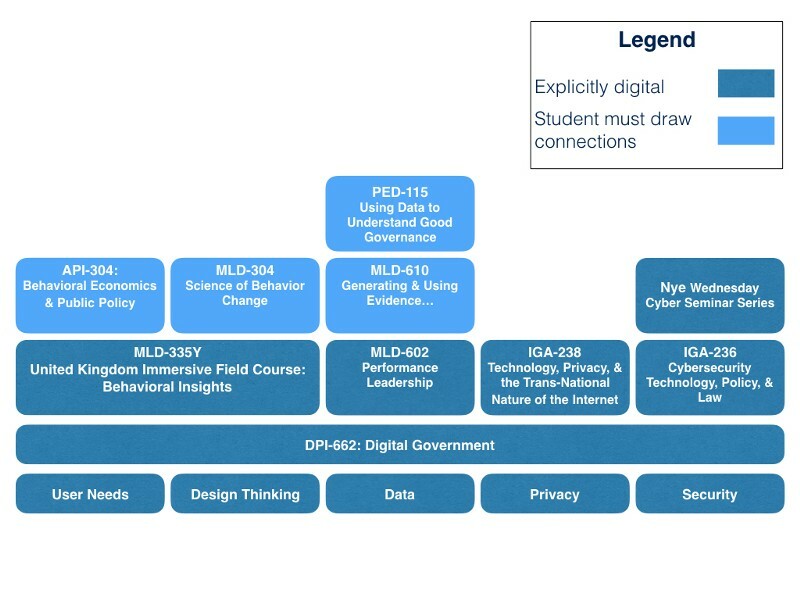 The dark blue courses are explicitly about digital/technology in government, while the light blue ones cover relevant subject matter, but may require the student to make linkages to the digital (perhaps by choosing their assignments or the cases they focus on strategically). Again, a basic grounding in the five disciplines outlined previously is an essential prerequisite. This is because this second batch of courses draws on all 5 in varying degrees. The courses may emphasize some — like say security or data — more than others, but having a grounding all five will both make these courses more enjoyable and enable students to learn more from them. This entry was posted in public policy, technology and tagged DPI662, harvard, HKS on August 31, 2016 by David Eaves. The UK Government Digital Service(GDS) is dead. I’m sure it will continue to exist in some form, but from what I’ve read it appears to have been gutted of its culture, power and mandate. As a innovator and force for pulling the UK government into the 21st century, it’s over. The UK government comms people, and the new head of GDS himself will say otherwise, but read between the lines of the stories as well as what former GDS people are saying, and it’s clear: GDS is dead. These narratives are also aligned as to why. GDS was killed by what the Brits call “Whitehall.” This is short form for the inner and elite circles of the UK public service somewhat cruelly depicted in “Yes, Minister.” Their motive? GDS represented a centralization of IT control, and the departments — for whom GDS frequently found savings of tens of millions of pounds and provided effective online services on behalf of— didn’t like seeing their autonomy and budget sucked away by a group of IT geeks. Losing GDS is a tragedy for the UK. But the downside isn’t limited to just the UK. It represents a blow to efforts to rethink and digitize governments around the world. While working independently, these organizations share a common sense of mission and so trade best practices and lessons. More importantly, a few years ago they benefited from a massive asymmetry in information. They understood just how disruptive the innovation they were seeking to implement could be. And not from a technology perspective, but to the organizational structure and distribution of power within the public service. As it became clearer to the rest of the public service in the UK just how far-reaching GDS’s vision was, and how much thinking digitally challenges the way senior public servants in places like Whitehall think… that asymmetry in knowledge and capacity didn’t diminish, but the asymmetry in awarenessand implications did. And so the center fought back. And it has far more power than any GDS might. But it isn’t just in the UK. I suspect the existence of GDS and its global network has activated a global counter-movement among senior mandarins. Public servants are connected across international borders by shared alma maters, common international organizations and professional groups, cross-border projects, etc.… don’t think for a second that that global network hasn’t been activated (particularly among Treasury Board officials) to what some see as a new threat. To be clear, this isn’t a GDS good, Whitehall bad piece. For anything to fail there is probably some shared responsibility. And assigning blame doesn’t really matter. What I care about it preserving what I and many others believe are important efforts to modernize governments so that the effectiveness of government, and trust in its institutions, are maintained. So what does matter is, if you work for a digital service outside the UK, it is time to go double down on political cover and/or to reach out to the senior public servants around you and build some alliances. Because your Whitehall equivalent definitely has relationships with the UK Whitehall, and they are asking them what they think and know about GDS, and their story probably isn’t a good one. The empire of traditional siloed bureaucracy is fighting back. You probably won’t beat it. So how are you going to engage it? This entry was posted in commentary, public policy, public service sector renewal, technology and tagged GDS, gov20, USDS on August 12, 2016 by David Eaves.